This week, the first of two articles on Postcard Records and the sound of young Scotland. In this edition and the next we’ll be looking at the roster of Postcard Records, a Glasgow-based indie label which existed in 1980-81. During that time Postcard released a series of singles which established a sound that combined various pop elements from the sixties and seventies with the new energies of the post-punk era. “The sound of young Scotland,” as it was called, was pure indie pop before such a thing really existed on any significant scale, and has served as a blueprint of sorts for many contemporary practitioners, being a particularly important influence on numerous Scottish artists in the years since. Though only active for a little over a year, Postcard Records was a very significant happening in UK music. Making fab records with very little money, aiming for pop greatness despite ambition oftentimes outweighing proficiency, and striving for perfection of substance rather than technique are all basically given concepts for us nowadays, but that wasn’t the case in 1981. The hip approach and witty amateur aesthetic of the Postcard scene would eventually find fuller expression in the nineties, with a new crop of groups following the path and the musical climate becoming more attuned to the label’s original sensibility. Owner Alan Horne even re-activated the label for a time. So, the bands: Orange Juice, Josef K, and Aztec Camera. The Go-Betweens had one record released by Postcard as well, but we’ll be looking past that one here in favour of the three main groups. Of those three, Aztec Camera were the least influential, the least discussed, yet most commercially successful and longest-lasting, but the least in-tune with the label’s aesthetic, so we’ll start there, saving the other two bands for next time. That’s not to say Aztec Camera didn’t fit with the label, of course, because they did so quite well, but their two singles for Postcard stand out among the label’s other sides. Perhaps because, more than anything else, they came from a classic, even pre-rock and roll, pop sensibility, as opposed to the more jagged, punk-informed sounds Orange Juice and Josef K were making at the time. When talking about Aztec Camera, we’re talking about Roddy Frame, the singer and songwriter behind it all, who, at the time of the first Aztec Camera singles in 1981 – “Just Like Gold” b/w “We Could Send Letters” and “Mattress of Wire” b/w “Lost Outside the Tunnel” – was just sixteen years old. The teenage songwriter’s contributions to the sound of young Scotland were remarkably accomplished, showcasing a pop talent which seemed destined for greatness. His backing band changed often, and Frame’s presence would be the only constant throughout the years, but he managed a great deal of success early on. After the Postcard sides, he signed to Rough Trade and released his debut LP High Land, Hard Rain, to much acclaim, in 1983. The record contained re-recorded versions of the b-sides of his Postcard singles, along with a number of other deft compositions, and remains, for many, his best work. Frame followed his debut with the Knife LP the next year, which saw him moving into major label territory, where, despite some relatively successful singles over the next ten years, he never really managed a breakthrough and languished. 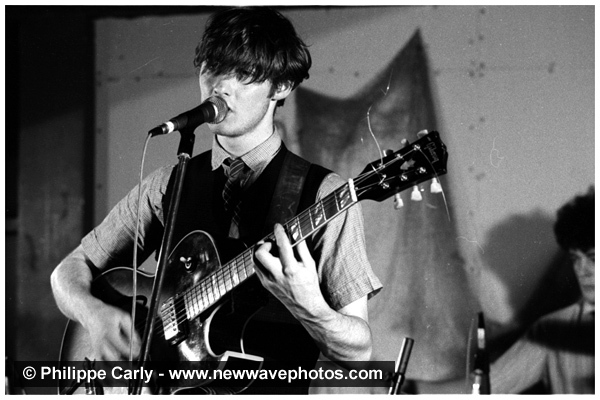 Throughout the late eighties and early nineties Aztec Camera released a total of four albums, none of which matched up to the quality of or ever found the same acclaim as his early records, and after 1995 Frame started performing and releasing records under his own name, which he is still doing. Still quite unrecognised outside of the UK, Roddy Frame has had a long career since his emergence as perhaps the most literal example of the sound of young Scotland and his brief contributions to the label’s brief catalogue remain impressive efforts that stand out among their better-known fellows. Next time we’ll look at said fellows, the definitive, influential records that Josef K and Orange Juice did for Postcard. In the meantime, check this BBC Scotland documentary out. It covers Scottish pop over the last thirty years in general, but a good deal of it is focused on Postcard. As is usually the case, however, it only mentions Aztec Camera in passing.